The world is fragile. A wave of violence has engulfed the Middle East, with the aftershocks threatening the entire globe. Millions of people are fleeing bloodshed, with a wave of refugees now risking their lives to shake the foundations of Europe. And economic instability is only spurring this volatility. As conflicts grow more complex and the world becomes more interconnected, is there a way to keep the global order intact or are we all heading into another large-scale collapse? 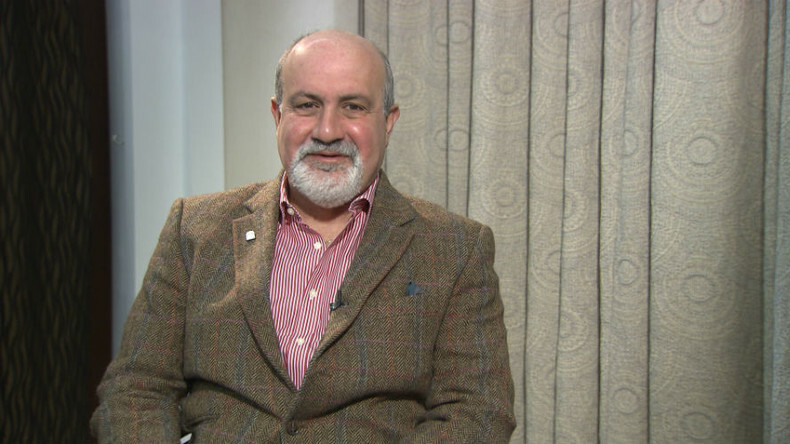 We ask the bestselling author of 'Antifragile' and 'The Black Swan' – risk analyst Nassim Nicholas Taleb. Sophie Shevardnadze: Nassim Nicholas Taleb, it’s really great to have you back on the show, welcome. SS: Good to have you in Moscow. NT: Honored for the invitation. SS: So, listen, I want to talk to you about global issues. For instance, it does feel like the world right now is full of tensions - we have armed conflicts, we have terrorism, we have bilateral sanctions, military drills. Should we be prepared for a full-scale global armed conflict? SS: So they are immune to conflicts? NT: Not immune, but they know how to handle it. I’m more worried about India-Pakistan, I’m more worried about places where things can get out of control. The relationships between U.S. and Russia are like those between cousins. They don’t get along, but they know how to handle their differences. SS: Let’s talk about the obvious conflict right now that’s everyone is concerned about, and that’s Syria and we see how major powers are trying to make a difference there to no avail. Do you feel like this could turn into another Lebanese war that will last for 10 years? NT: The thing is, there’s one central element to the Syrian conflict, and that is not something that came out of nowhere. It’s not like spontaneously grown Arab Spring. The Syrian conflict, that’s what the West didn’t get is that it was largely induced by Saudi financing, by Salafi-Saudi financing. It’s obvious for me there, we have the data, we know pretty much how it started or how it was fueled. We know which parties fueled it. Now, I don’t think that the alliance, if you want to call it an alliance or a working relationship between the U.S. and Saudi Arabia is something permanent, because I would guess maybe between 80-90% of American public would be hostile to Saudi Arabia. Most people know that Saudi Arabia finances directly or indirectly - most certainly indirectly, but possibly directly - these armed groups. We know that they did finance initially the Al-Qaeda, we know that they will finance future armed groups. It’s their religion, you know, it’s based on Jihad. Saudi Arabia is the Wahhabi state that is very similar to ISIS, ok. So we know that, the only problem is that there’s a class of people in the U.S., that crust that are under the sway of Saudi Arabia via public relation firms. So, this can fall apart in which case, the relationship between Saudi Arabia and the U.S. would be changed entirely. SS: So, it all comes down to money, really. NT: A lot of the images we have of the Syrian conflict, we know have been doctored up by PR firms in London, Qatari-financed or by the United States. So, there’s money influencing journalists. The relationship between the U.S. and Saudi Arabia is strategic and whatever you want to call it, it’s not a natural one. SS: And you’re thinking it’s not going to last? NT: Because of the dependence of the U.S. on oil, it’s much lower today that it was in the past - on foreign oil - and because we have other sources of energy and people are seeing it coming. SS: All those factors that you’ve just cited - how will that play out in the ending or not ending of the conflict in Syria? NT: I can’t see the U.S. continuing an alliance, and not a very comfortable alliance with people who engineered September 11. It’s very hard for… you see, at some point, the contradictions of the foreign policy will emerge - because the U.S. is in fact also fighting Al-Qaeda. When you’re fighting ISIS, you don’t know whom you’re fighting. So, there’s a contradiction in American policy, they are fighting ISIS and are supporting the moderate rebels, but the moderate rebels are not really moderate. There’s no such thing as moderate rebel, in my opinion. NT: There’s no such thing as Salafi. SS: Rebel is a rebel, and terrorist is a terrorist. NT: Exactly, it’s like someone who’s half-pregnant. It may exist, but definitely not in that kind of environment. So, that would definitely lead to, maybe, some alignment of interests of the U.S. and Russia. SS: So, you’re thinking if the two major powers come together and start fighting terrorism - that would actually put an end to Syrian war and eliminate terrorists in Syria? NT:No, to the Syrian regime. And then you have another thing, don’t forget Europe - Europe, but now - France, for example, with Salafists, they’ve had it. And Salafists are much more of a threat to Europe today. So, they have no interest in having a Salafi victory in Syria. SS: Tell me something, the way you talk about countries in crisis, in your books, it would seem that Syria should come out of this conflict less fragile. Is it a fair assessment or it will disintegrate? NT: Not quite for Syria, because you have… Syria is unnatural. They call it a national state, but you have… If you partition Syria, which is something nobody wants to consider - at some point people did consider it - the part that’s Mediterranean, non-Sunni, it will be Alawites, Christians… We can call it “urban Sunnis”, more like “Ottoman Sunni” - that part, will be, definitely, much stronger. They really will get rid of their cancer and then they will be able to grow… particularly, after war, you have reconstruction, and stuff like that, and I’d be comfortable with the state like that, breaking Syria in half. But that’s not what the Syrian regime wants. They want the whole thing, and I know a lot of Syrian Sunnis who also don’t want partition. So, I don’t think it’s on the cards. The second option would be, probably, to reduce, to confine the Salafists to some remote areas, and try to manage without them, in which case, also, it will have reconstruction. And the third possibility is to rebuild Syria, but very decentralised, in which Salafists… - like Lebanon, Lebanon was very decentralised after the war - so, in Lebanon, someone can be a religious fundamentalist of any religion so long as people don’t bother you in your neighborhood and you don’t bother people in their own neighborhoods - okay, you can manage a long-term relationship. I think what will happen with the decentralisation of Syria, if you will have some kind of decentralisation, it may solve their problems, but at the same time spur the areas by the Mediterranean, you know, the minorities. SS: So, I want to talk about all of the Middle East, because you’ve said that centralisation of power in the Middle East actually made the Middle Eastern states vulnerable to the aftershocks of the Arab Spring, and it’s true, we have so many conflicts in the region - we have Syria, we have Libya, Yemen, Iraq, in Afghanistan it’s far from being over. You’ve mentioned Pakistan - we don’t know what’s going to happen there. Do you feel like the current makeup of the borders of the region, regimes as well, are too antiquated? NT: Yeah, of course - Iraq is an artificial state. You always have instability when you have roommates, and you can solve the instability by giving them separate apartments. A friend of mine has done quite a bit of research on that and he called it that ‘good fences make excellent neighbors’. You can see that in Switzerland, where relationships improved dramatically once you have some kind of separation - physical, legal, whatever separation you want, financial, fiscal separation - people finance their own roads, so decentralisation works in that sense. The French, unfortunately, when they advocated for Sykes-Picot they mixed people that should not have been mixed, and broke up people that shouldn’t be broken up. But if you continue the reasoning, you’d realize that southern Turkey was something that should belong to Syria, and where historical capital of Syria should be. SS:Yeah, I mean, historic borders change all the time, tell me of a country whose borders haven’t been changed. NT: The way to re-do the Sykes-Picot isn't so much along the notion of nation-state, by the way the natural closure of the area, the organic build is around city-states. That works a lot better. You had the Sanjak of Aleppo before, they were organized by Turks into city-states, which was natural organisation since Roman times. So, I think that decentralisation is imperative. SS: For the Middle East. SS: And then the decentralisation would lead to reorganisation of the borders, right? NT: Yes, but also coupled with decentralisation - which means you can keep Syria as it is, so long as you decentralise, you would not have the same sting you had with dominance of one minority over another… or one majority over the minority. So, you can’t just be changing the borders, you also have to decentralise, because no matter how you change the borders, you will always have minorities, and the problem of the Middle East - let me explain for the viewers what was the problem. Think Iraq: Sunnis dominated until George Bush came, and then the Shias dominated Sunnis, and you had ISIS. So you cannot afford to have one ethnic group dominate another ethnic group, you have to make sure that there’s no spot on the map where someone is suffering. SS: Because of the other group. NT: Because of the other group. SS: And it is still as violent as it was. Tell me more about it, because people do tend to think that post-WW2 the world is less violent than it was. NT: There’s a very simple way to explain it. I don’t have the numbers in my head, exactly, it’s early in Moscow today, with jet lag, but the concept is as follows: some people naively assume that our world was different, because we haven’t had a major war now for about 60-some years since 1945. And history, if we take the last 2,000 years - you will notice that wars such as… large wars that killed more than, say, 5 million people, happened on average every something like many years - wars that killed five million, in today’s population. To make claims that we’re not going to have… you know, “there’s a drop in wars” - you need much more than 60 years. That’s the first statement. And the second one is that we have had quite a bit of near-misses over the past 50 years. You remember 1960s, something happened in 1960s in the aftermath of the Bay of Pigs - so there was some tension. And now we have more - we have nuclear weapons, and these are much more destructive than before. So, if anything, I see that in this days nothing has changed, but the weapons that we have… if something changes, it’s going to be much more brutal. SS: But isn't that crazy? Why aren’t things like economic ties, or economic integration, free trade, faster movement of goods - preventing conflicts? Is the world not integrated enough, economically? NT: I don’t think economic integration has helped, because the Roman Empire had plenty of wars and they had different economic integration, and before 1914, globalisation was really right there. It was at its maximum in 1914, right before the big war, where people were buying meat from Argentina, getting textiles from the UK… There was globalization before 1914, yet it didn’t stop people from waging wars. The only environment - I would say that, but it’s not part of my formal studies - but I would say that the only environment that seems to be good for peace is the city-state environment. Empires come and go, city-states stay and merchants don’t like wars - but merchants don’t run the world. Merchants are not represented in Washington. SS: So, these gigantic free trade zones - you don’t think they will change world for the better? NT: Or a regular Asian person, but if you ask someone in the Rust belt or what used to be the Rust Belt, if you ask them: “What would you like to do, would like to make shoes, and have a job and identify yourself with the product, or you would like to be slightly richer but have a different job and be able to afford shirts for… Shirts today are cheaper, because they are made in China, they are cheaper than they were in 1970, in nominal dollars. So, what would you rather do? I mean, people can have different choice - maybe, they’re more interested in having their ego in the product, okay, to say “I make shoes”, when people identify with their profession, than have higher standards of living, something that fits economic textbooks better - but not their ego. Maybe people want to feel that they identify with the product. SS: Tell me about the upcoming crash. You say that markets will ultimately crash again, only that this time it will hurt much more people - do you believe that the crash will originate from the U.S. again? SS: But do you believe that that problem originates from the United States or it’s a problem of the developed world in general? NT: No-no. Not directly from the U.S. asset valuation, but the policy of putting interest rates at zero in the U.S. was followed by Europe, and they experience the same asset bubble. So we have an asset bubble in the U.S. and Europe, and I don’t know about other countries. It definitely is not very healthy, so at some point… And the problem is, I have never seen a bubble deflate gently in my career. SS: Do you still feel like the world should prepare for austerity? I mean, it hasn’t quite worked for Greece, why do you think it will work for anyone else? NT: The point is, people give you false choices. They tell you “austerity vs this” - they, in the U.S. and in Europe, they did not do any structural changes, they didn’t realize you don’t cure debt with debt, so if they call avoiding curing debt with debt - “austerity” - there’s something that I don’t understand in the way they think. They don’t realize that the crisis came because we had too much debt in the system, and if you want to avoid future crises, you have to have a system that can function better without being burdened with debt. You need, also, structural reforms, you need to do something structurally to allow people to start companies more easily. They did not realize that that was the problem, so they give you a false thing: austerity vs … you know, “tightening vs easing”. The problem is not at the monetary level, you don’t solve a severe structural problem with monetary policy, like no more than you solve cancer - you try to cure cancer or mitigate the effects of it with painkillers. So, monetary policy is a painkiller. SS: You also said that America needs austerity like Greece. Do you think this is still the case? SS: You don’t like the word “austerity”? NT: No, of course, we’re going to say that we need to change the system. What they call “the reverse of austerity” is, what, putting interest rates at zero, where regular people can’t borrow, but who can? But the very rich can still borrow, and you have an asset bubble. That’s what the opposite of the austerity is? I mean, I don’t understand. SS: Let’s talk a bit about the perception of the EU, you’ve said that it is inevitable that it will collapse. SS: Why do you think so? If we don’t take Britain, because it’s a separate thing - I don’t really think any state really wants to leave, continental Europe would rather act together and have more clout than act separately, no? SS: What if the bureaucracy structure in Brussels changes and it’s less top-to-down? NT: That top-down problem of Brussels is… let me tell you what happened, it was metastatic bureaucracy. If you build something from a bureaucratic thing, particularly if you don’t even have a nation-state to back it up, you end up with people doing the following: they legislate the speed of windshield wipers on farms in great detail, with inspections and stuff like that, and burden it on people, and things they say: “We want to manage your security”, they are regulating toasters - the intensity or how much electricity the toaster in the UK can consume, but at the same time, they can’t guard the borders, you see. So what do bureaucrats do? Bureaucrats are very good at doing something that impresses other bureaucrats, but in the end, they’re not doing the essentials. What do you want … if Brussels should do something, it’s guard the borders first, okay, and then worry about toaster ovens later and they’ve done it backwards. So this is what: if you let bureaucrats run any business, they destroy it, and so I see no reason why Brussels… I’m not against the concept of Europe, but I’m in favor of a looser deal, where people have the right to have their own deal on the side. SS: Mr. Taleb, thank you very much for this interview. As usual, very interesting talking to you, and hopefully we’ll see you next year.